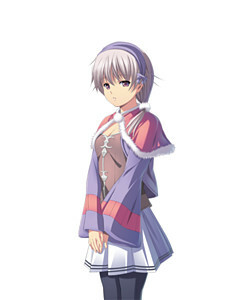 Description The poster girl of the Amakakeru Oyou pub and the guildmaster's only daughter. A capable girl who runs the pub together with her father yet is also capable of managing the guild's administrative affairs alone. Perhaps it's because of her upbringing; Lusit is pleasant and offers a ready smile to all. Her gentleness and boundless tolerance greatly endear her to the pub's regulars, but she's also capable of razor-sharp wit whilst smiling. Both the pub's regulars and guild members acknowledge the unwritten rule, "Do not under any circumstances anger Lusit." The poster girl of the Amakakeru Oyou pub and the guildmaster's only daughter. Perhaps it's because of her upbringing; Lusit is pleasant and offers a ready smile to all. Her gentleness and boundless tolerance greatly endear her to the pub's regulars, but she's also capable of razor-sharp wit whilst smiling. Both the pub's regulars and guild members acknowledge the unwritten rule, "Do not under any circumstances anger Lusit." [Spoiler] Lusit is secretly attracted to Edgar and gets jealous when he openly shows affection to the female guild members or travels to the brothel to acquire information. Although they needle each other frequently, they trust each other in times of crisis. The child of heretics who worshipped the Evil Deity, she was initially brought into the world in order to be used as a sacrifice to the Deity to improve her parents' material well-being. However, her father had a change of heart and fled the heretical community with Lusit in town. Meeting Monos by chance, he stowed her inside Monos along with a tablet bearing her name, which was the first and last gift she received from her birth parents. When Neil discovered Monos in the depths and found Lusit inside, he retired from adventuring and set up the guild to better take care of Lusit. Lusit frequently has dreams of the heretical community and its surroundings. The dreams are so lucid she can accurately recreate what she sees in drawings. Neil lied to her about her origins and always planned to tell her the truth when the time came, but never got round to it. The poster girl of the Amakakeru Oyou pub and the guildmaster's only daughter. <hidden by spoiler settings> Lusit is secretly attracted to Edgar and gets jealous when he openly shows affection to the female guild members or travels to the brothel to acquire information. Although they needle each other frequently, they trust each other in times of crisis. The tablet which contained her name is written in a language so obscure and old; only gnomes and Dinetia are capable of reading it. Records found later also reveal Lusit is much older than she looks, but her storage inside Monos and the golem's ability to sustain life using mana as a form of nutrition has kept her from ageing until she was taken out by Neil.